Imogen's Typewriter. 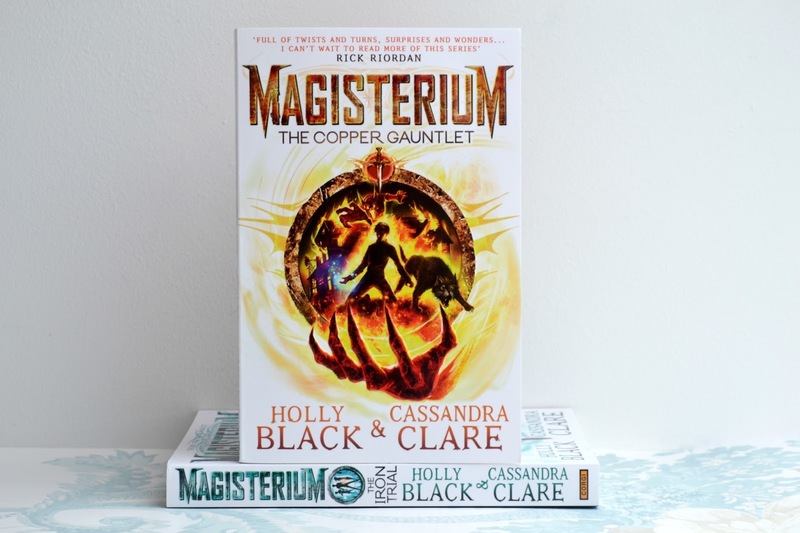 : Book Review: Magisterium: The Copper Gauntlet by Holly Black and Cassandra Clare! Book Review: Magisterium: The Copper Gauntlet by Holly Black and Cassandra Clare! Contains minor spoilers for The Iron Trial. Haven't read my review? It's here! It’s not easy for Call... and it gets even harder after he checks out his basement and discovers that his dad might be trying to destroy both him and Havoc. This book took me a little while to get into. I picked it up right after I finished The Iron Trial and I'm not sure if it was a reading slump or just that the beginning just didn't interest me. I took a break and read another book before picking it up again. I got into it that time though and it was a whole different story. I found myself trying hard to read faster and faster so I can find out what is going to happen. Now I have my head around how the magic works, who the characters all are and what the places look like, it was easier to jump into the world. Especially because there wasn't much of a time skip, just to the end of Summer which I find happens in most books centred around school. The characters are developed further in this book, especially as we get so see Tamara at home and the control her parents have over her and her sister. There is more with Aaron but I still feel like I want to learn more. And, to my enjoyment, Jasper gets more page time. I'm a sucker for old money turned poor characters. And he's hilarious, the way he interacts with the three is so real and I hope we get more Jasper in later books. But Jasper isn't my favourite, Call still holds that place in my heart. He did something in this book that had me have to put it down I was laughing so hard. Yes, he's a bit of a brat, like every 13 year old but he's kind under his sarcasm and his struggle with- being the soul of an evil overlord in an innocent body just has you routing for him. He wants to be good and that's the difference from just a regular bratty teen who couldn't care less. The story finishes of smoothly with no huge cliffhanger, but leaves open a few threads of intrigue. And overall, even though it took me a while to get into this book, I enjoyed it a lot and I think it has great re-readabiliy. If you read the first book, this doesn't disappoint. I'm already looking forward to the next book. Even though since this one hasn't even been published yet, it means I have even longer to wait. What a cruel world. This book is being published on the 3rd of September and yo can pre-order it here! Haven't read the first book? You can buy it here! Have you started the Magisterium series yet? Are you excited for The Copper Gauntlet? *This book was sent to me for review. I am not obligated to talk about it. Amazing links are affiliate links. Beauty Review: Lush's Sweetest Thing Gift! 5 Things I Love About Blogging! 5 Reading Goals for 2015 with 5 Months to Go! Books I Read in July!